The role you want to assign MSSA members is "contributor". Choosing The “Right” ties together opinion polls, newspaper articles, and a vast array of the author’s personal experiences as a Mormon Democrat in Utah to provide a general introduction to what he convincingly portrays as a serious problem: “A preponderance of LDS Republicans believe that their choice to live a gospel life is synonymous with choosing to support a Republican political ideology” (xi-xii). After a brief, 11-page overview of the historical rise of Republican politics in the LDS Church, Brown begins to make the case, aptly citing Putnam and Campbell’s Mormon interview results from their book American Grace, that the identity label “Mormon Democrat” has become a culturally unquestioned oxymoron. Brown is most successful at elucidating this oxymoron when he cites documented personal experiences, his own or those of others, to open an intimate window into the confusion and damage caused by Mormon prejudice towards Democrats in contemporary Utah. Chapters 3 and 4, “Can a Democrat Be a Good Mormon?” and “Alienation in the Church,” are ethnographic gems that include everything from high-ranked local church authorities deriding Obama voters from the pulpit to laity poking fun at Democrats as if doing so were an ecclesiastical norm. This last hearkens back to a poignant story in the introduction wherein the author, assumed by his coreligionists to be a fellow Republican, storms out of a Sunday worship service that has degenerated into a Democrat-bashing contest. Having substantiated his claim that US Mormons often conflate the GOP with gospel worthiness and the Democratic party with unworthiness, Brown, in the last section of the book, elaborates on some of the indirect repercussions of these conflations. Though he does not delineate his logic explicitly, he seems to be arguing that since a majority of US Mormons think God expects them to vote Republican, and since Mormons are a majority in the state of Utah, Utah has become a state of one-party rule. He then skillfully demonstrates, in Chapter 11, how one-party rule puts unchallenged power into the hands of an increasingly unrepresentative few. This undermines healthy democratic processes in Utah as like-minded elites legislate in secret while fully expecting the public to trust they are ethical simply because they are Mormon. Chapter 11 provides an incisive examination of how unethical these Mormon government representatives can be in the state of Utah and the brazen efforts they make to keep the public uninformed about their actions. 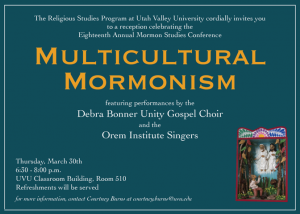 How has the co-evolution of US-expansionism and the Mormons’ own Manifest Destiny in Utah influenced Mormon politics? How have the Mormons’ early use of theocracy and current use of divine calling (rather than elections) affected the membership’s expectations of representative government? How has the US-exceptionalism enshrined in Mormon holy books (replete with declarations such as those implying that Christopher Columbus was inspired by the Holy Ghost, that the US-perpetrated genocide of Native Americans was justified, and that the US Constitution is a divine document) affected the membership’s loyalty to the Republican party and the Church’s relationship to the rest of the world? How has the Republican party changed over time and how have Republicanism and Mormonism shaped each other? 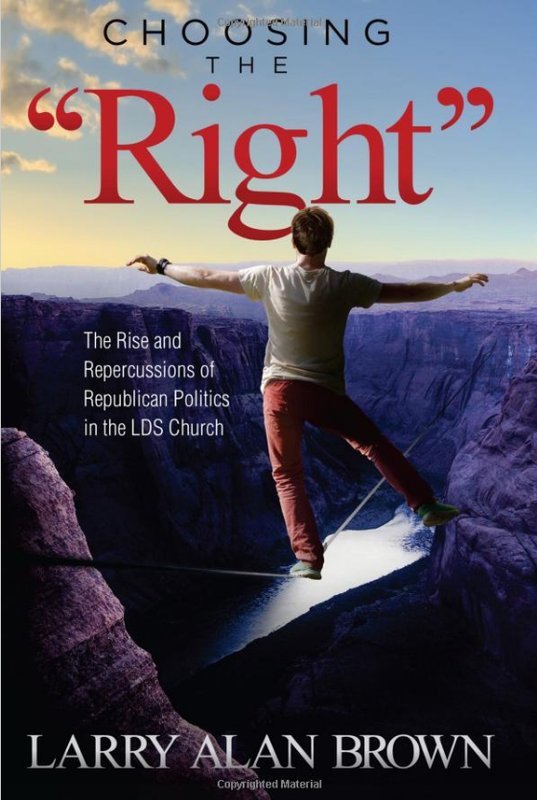 From the beginning of the church until the present time, in what ways are specific Church leaders (other than Ezra Benson) to blame for the continued assumption among Utah Mormons that choosing the “left” is morally wrong? How have Mormons historically separated what is political from what is moral or spiritual? How have individual Mormons historically and currently justified, in speech or writing, their choice to vote for one candidate or another? 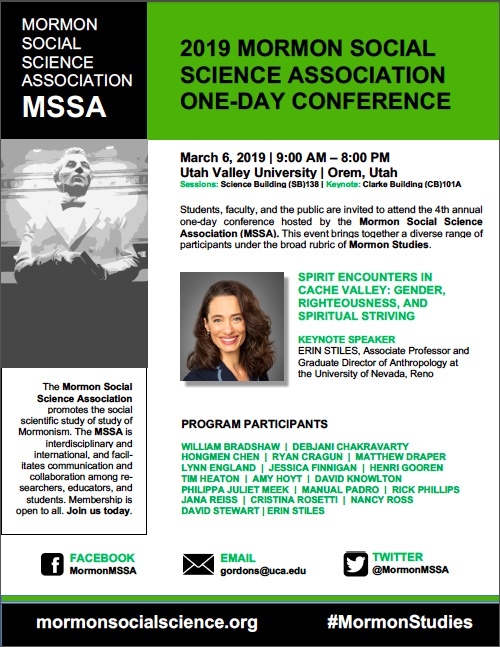 Here is the program for the MSSA mini-conference at UVU this week. 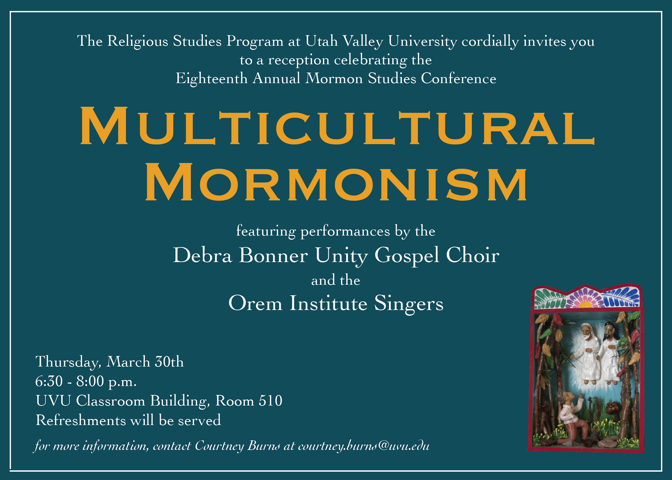 In conjunction with the annual Utah Valley University Mormon Studies Conference, the Mormon Social Science Association looks forward to hosting a one-day mini-conference on the campus of Utah Valley University. We invite and encourage a range of proposal topics relevant to the scientific study and understanding of contemporary Mormonism. 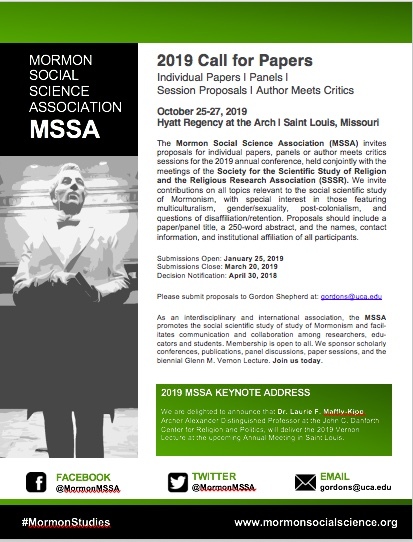 Those interested in presenting a paper or organizing a panel for this conference should submit a one-page proposal which includes a tentative paper/panel title, a brief description of the focus of the presentation, your institutional affiliation, and your contact information.